1) Tell us about the history of your café. The Emma Chase Café opened in the old “dime store” building in 1982 when there was no café in Cottonwood Falls. Before I took over the café in 1998 I was a registered nurse in South Texas and already owned the building next door to the café. When the previous owners decided to give up the café, I moved back to Kansas to run Emma Chase with the philosophy of providing really good, home-cooked food to our family and friends and a wonderful, nostalgic Chase County/Flint Hills experience to our guests. 2) What makes your café unique? We are known regionally, nationally and internationally for our good food and Friday Night Jam Sessions. Music at the Emma was even voted an “8 Wonder of Kansas” a couple of years ago. Plus, the Emma Chase Café is the same one featured in William Least Heat-Moon’s book PrairyErth. To this day, we have guests come through the door with that book tucked under their arm. 3) What are your menu items? Our “Heritage Menu” offers Angus Burgers, Flint Hills-raised Bison Burgers and Elk Burgers. Our signature item is the Emma Burger – one-third pound of Black Angus beef, served with grilled onions, two kinds of cheese and honey mustard dressing. We are also well known for our daily Chicken-Fried Steak Dinners, and our hand-breaded Chicken Strips are divine. Our Sunday Pan-Fried Chicken Dinner, with real mashed potatoes and gravy and our marvelous green beans, is reminiscent of life in Chase County in the “good ol’ days.” On Friday nights, we always offer our famous Fried Catfish Dinners, and our pie is wonderful anytime. 4) What is the one “must try” item? Miss Emma’s Signature Home-Made AppleButter – which we also sell in the Emma Chase Country Store next door. 5) Do you offer any special events? 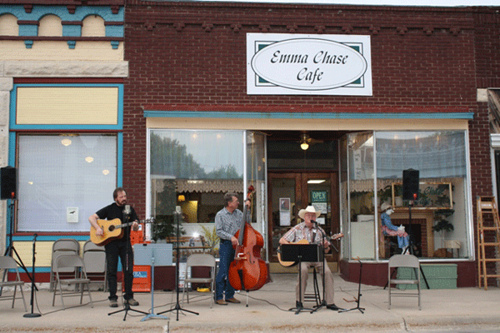 The Emma Chase Cafe produces the Prairie Fire Festival in April, the Flint Hills FolkLife Festival in June and the BroomWeed BlueGrass Festival in September. We also sponsor four Victorian Balls/Contra Dances annually and offer an impressive Biker Breakfast Buffet on the third Sunday April through October. Learn more about the Emma Chase Café.